Taghobby.com has posted a couple of new scans from Figure King magazine #194 featuring upcoming Masterpiece figures. We get our first look at MP-20 Wheeljack in color, a teasing silhouette image of MP-22 Ultra Magnus and work in progress art from the forthcoming Masterpiece Star Saber. The scans also feature Movie Advanced AD01 Optimus Prime, Kabaya Series 8 and Transformers Cloud Brawn and Starscream. Wheeljack - Wish the windshield was light blue or clear. Magnus - Nice to finally see something. AD01 Optimus Prime - Yikes! Drastically different from Hasbro's! Ultra Magnus is a Phase-Sixer. I guess he can handle that now! Wheeljack, so good! It's true his bot mode has more green than in the cartoon, but that's the sacrifice they have to make for a more accurate car mode. Which looks amazing, by the way. A little lighter on the sponsors than I was expecting, but they got the big ones right. I'm surprised to see the car doors end up on his legs. I still haven't quite grasped the transformation, but it looks cool. The one criticism I have is that his waist looks really weak and flimsy. I guess a lighter windshield would be nice. They must've been going for car mode accuracy for that too. What's with OP being so silver? Also have to say those Kabaya kits are looking good, although I'm unsure if I want to continue with the series. I am unspeakably excited about Ultra Magnus and very happy that we have reached the silhouette milestone. Does anyone have an opinion on Magnus' release timetable? So we received a silhouette of Bee a month or two ago and he is due for release in November, could we see Magnus by December or is that being too optimistic? And what is a phase 6-er? Six transformation steps? PadForce wrote: And what is a phase 6-er? Six transformation steps? its a pun,reference to the IDW comics lol..but in the magazine it shows that magnus is in phase 6, i guess he'll be released AFTER an MP star saber which is phase 5..
wow.. the colors on wheeljack are very disappointing... he still looks great.. he just doesn't have that same "straight from the cartoon" look that the others do. i hope they release some sort of exclusive with a simpler more animation accurate color scheme..
prowl, blue streak and smokescreens real world paint jobs translate really well to looking like the show, this however falls REALLY short in giving off the same effect. also.. magnus looks like he's going to be my favorite masterpiece.. right now it's prowl.. but magnus just looks incredible.. i'm super excited for bumblebee and wheeljack.. but i'm two times as excited for magnus.. so exciting. what a GREAT time to be a G1 fan. well.. i think takara's plans were to do two small molds and one large per year.. so.. magnus would fit the large figure, but that's assuming star saber is counted as an extra rather than part of the normal G1 line.. i doubt it'll be that way, but i'm WAY more interested in magnus than i am for saber. whichever one comes out first, i assume they'll be out around christmas time. I'm really very surprised to see any sponsorship logos on Wheeljack. I'm liking what I see a lot, glad I've ordered two. The way they've got that Optimus posed makes it looks SO much nicer than all the previous pics, and I just want it even more! Blinged out Leader Prime? Nice, but I'll try for the regular Leader (as a reminder, it's a different mold from the First Edition one). By the by, it look like TakaraTomy will follow Hasbro's lead by putting the Movie toys in Generations as well. Is it me, or does MP Wheeljack transform similar to Rodimus? I see pieces of the back in the chest area. Nice to finally hear an update on Ultra Magnus. 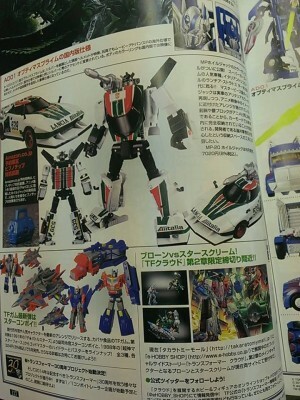 Wheeljack looks alright, but I'm not particularly attayched to him. Urgh, I need more than concept sketches for Star Saber! He and MP11 Starscream are the ones I really want the most. What the heck are they doing to Wheel Jack? White with a big orange dot on the hands????? stripes just above the waist???? big ugly pin marks on the hips with anemic thighs?????? warzon3 wrote: What the heck are they doing to Wheel Jack? Certain compromises have to be made. Mind you, this is a transforming figure so you can't expect it to be fully proportional or should I say not proportional as the original figure was. Iirc, my 1980's Tomica Lancia Stratos despite having diffent scales had wayyyyyyyyyy different proportions compared to the somewhat blocky Takara Diaclone. The MP version seems to be following the real world car proportion, same with BB. The orange dots are the back lights of his alt-mode. And if they or any of the other deco choices where missing you'd complain about the alt-moe sucking. I think Wheeljack looks OK, kinda disappointed myself though, but I'll reserve real judgement till we see better pics of him, ones that aren't on a white background and low quality. Magnus looks as interesting as a silhouette can, only thing I get from it is that it's finally officially official that he's coming. Ultra Magnus is scheduled to come out in August with Wheeljack. Since it's based on MP-10 and has been in development since before MP-10 came out. Silhouette means a prototype is made while Star Saber is still only showing designs. What are these so-called "phases"? Ultra Magnus is phase 6, Star Saber is phase 5, and AOE Optimus is phase 1. What does this mean? Also, do the AOE leader Optimus and Grimlock figures have any lights and/or sounds? Why do sites always call furtive pics snapped at the newsagent "scans"? 6,596 pages were recently viewed by 1,291 unique visitors. This page was viewed 1 times on Thursday, April 18th 2019 9:47pm CDT. © 2019 Seibertron, Inc. DBA Seibertron.com. All Rights Reserved. Established June 2000. Seibertron.com is owned by Ryan Yzquierdo.